This is the first time I have participated in the challenge and I am so glad I did it! 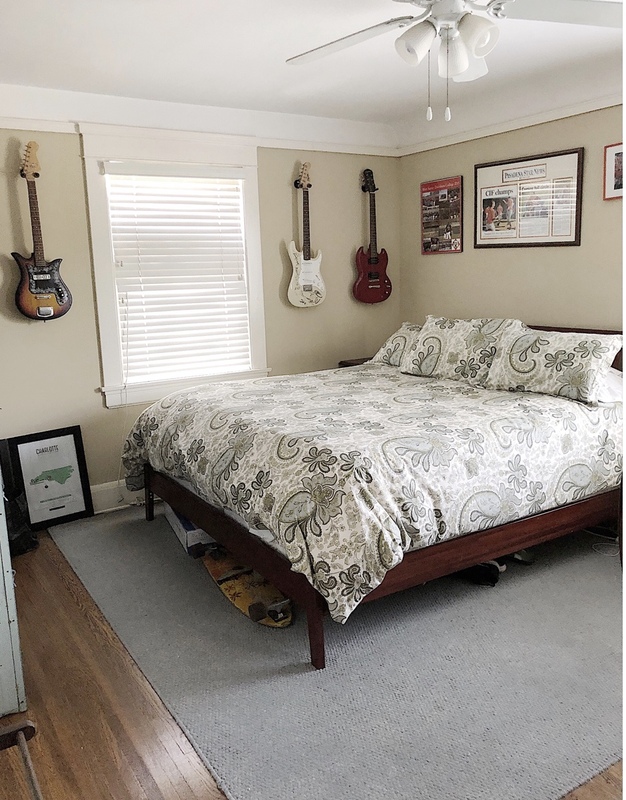 (There is another one One Room Challenge in the fall so you should consider joining in on the fun!) It’s been a very busy time of planning, working, ordering and lots of DIY’s. But I love the format in that it’s easy to stay on track over the six weeks. I fell as if the project was more manageable and the time frame was perfect! Before I get started talking about specifics, let’s revisit the “before photo”. I refer to this room as the “boys room”. It started out as Andrew’s room but when he went off to college it became Matt’s room. Then when Matt went off to college it became “Michael’s” room. Since Michael is home for the summer, it’s currently his room. As you can see, the room was pretty plain. And ugly. So the first thing I did was empty it out. That was a huge improvement. My first real project was adding board and batten to the walls. And when I say “I added” that means I added! My handyman cut the MDF but I did everything else. You can visit my blog post here for more information on how I installed the board and batten. Then I had the walls painted (Dunn Edwards Swiss Coffee). You might notice that I did not say “I painted”. This was a job for the professionals. 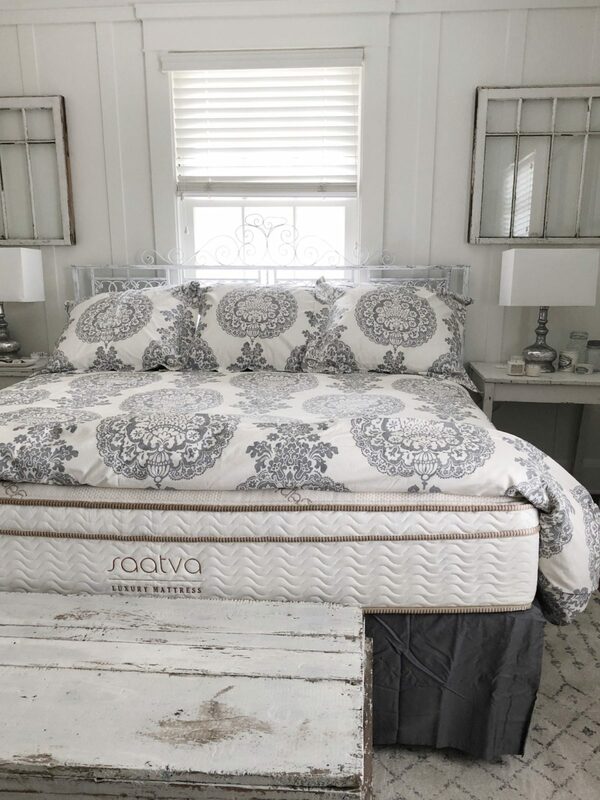 This project would not have been possible without my friends Saatva Mattress. I partnered with them and we chose this luxury mattress because of their eco-friendly products and affordable prices. I love that we ordered our bed online and that it was delivered in a few weeks. Delivery (and set up) was free and they even took away our old mattress. The bed is so comfortable! I decided to move the bed to a different wall. I had heard many complaints from guests about the tight fit when the bed was on the other wall. And wow, what a difference! I just love it. I purchased the vintage chippy headboard a few months ago at the Long Beach flea market. I wasn’t even sure at the time where it was going to go but it looks fabulous here. It was mostly black and white chippy so I actually ended up painting it white before it was installed. I managed to keep the “chippy” look which was really important. I was not about to move it downstairs again (it weighed a ton!) so I painted it in the adjacent bathroom! I also painted three pieces of furniture with Old Barn Milk Paint. I used the color Sweet Cream which is an awesome off-white. 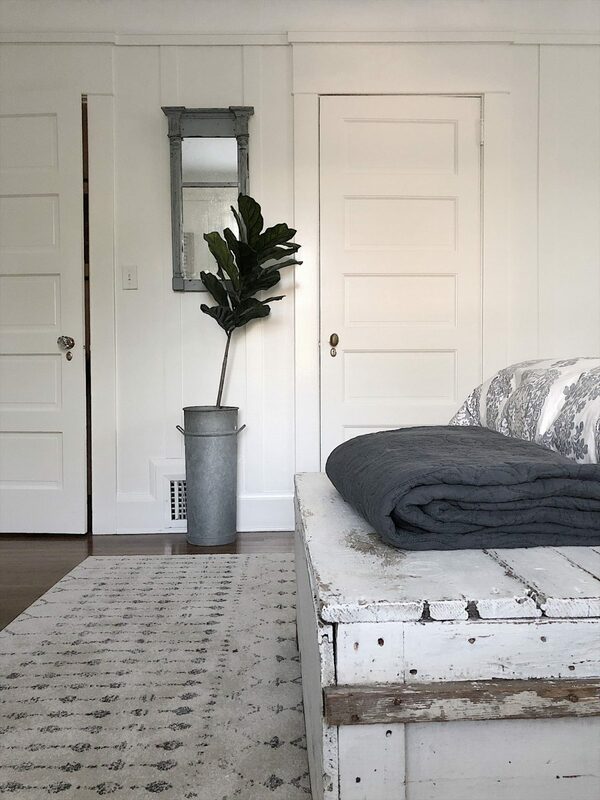 I had found two vintage end tables but one was painted gray and the other one was peach (of course it looked white until I brought it into this all-white room). 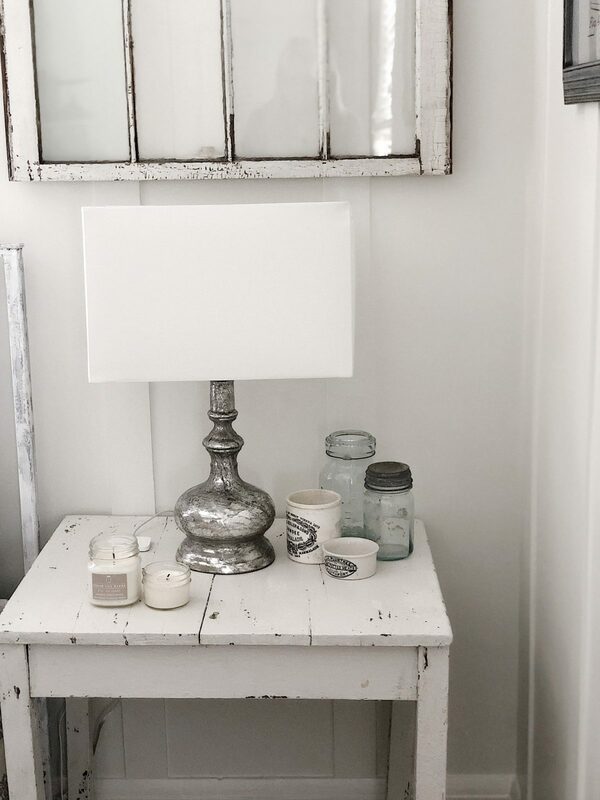 If you haven’t ever used milk paint then you need to give @oldbarnmilkpaint a try. It’s easy to use and I love how when it dries it randomly adds some wonderful chippy areas. Here are the two tables. I love that they don’t match. I did end up cutting off the bottom of the legs on the one that is a sewing table. It was about four inches taller and it looks so much better at the shorter height. 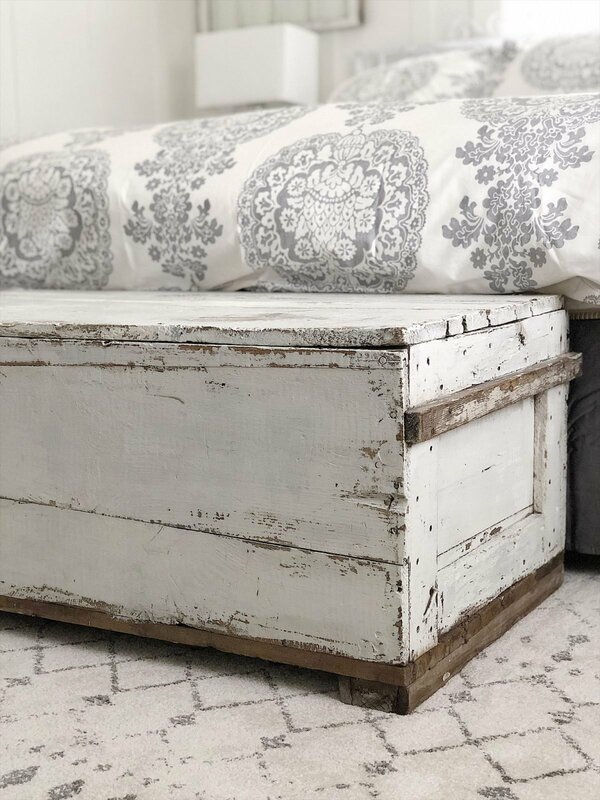 I also painted an old vintage white trunk with Old Barn Milk Paint. I bought this trunk last week at a pop up vintage sale. It was pretty beat up and the paint was looking kind of dirty. In fact, this is what the trunk looked like when I bought it home (after cleaning). You can also see what the sewing table looked like painted gray. 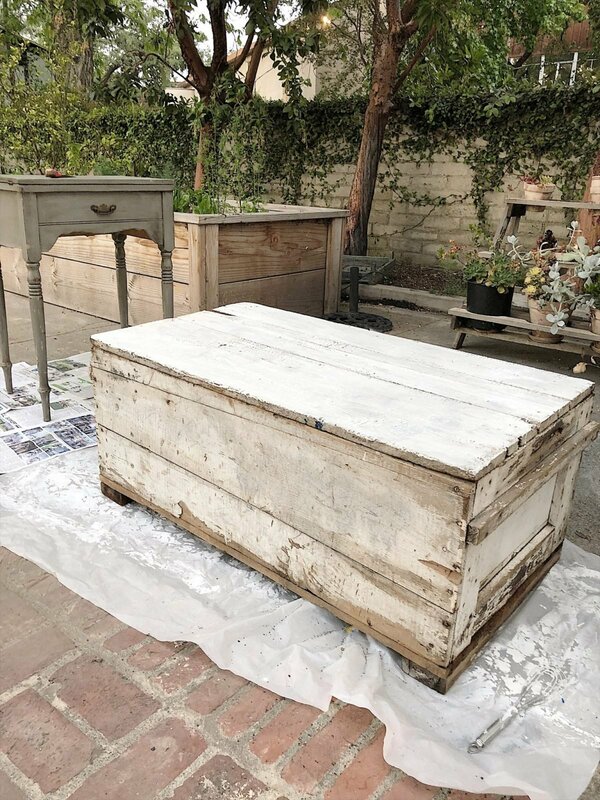 I decided to paint the chest with Sweet Cream Old Barn Milk Paint. It still looks chippy and vintage but I like it so much better painted. 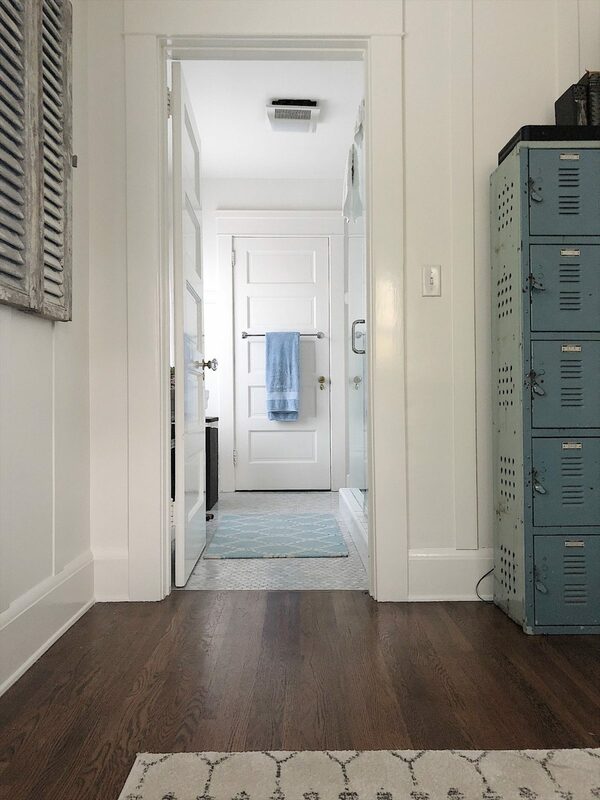 Isn’t it fabulous that milk paint can allow you to do this? 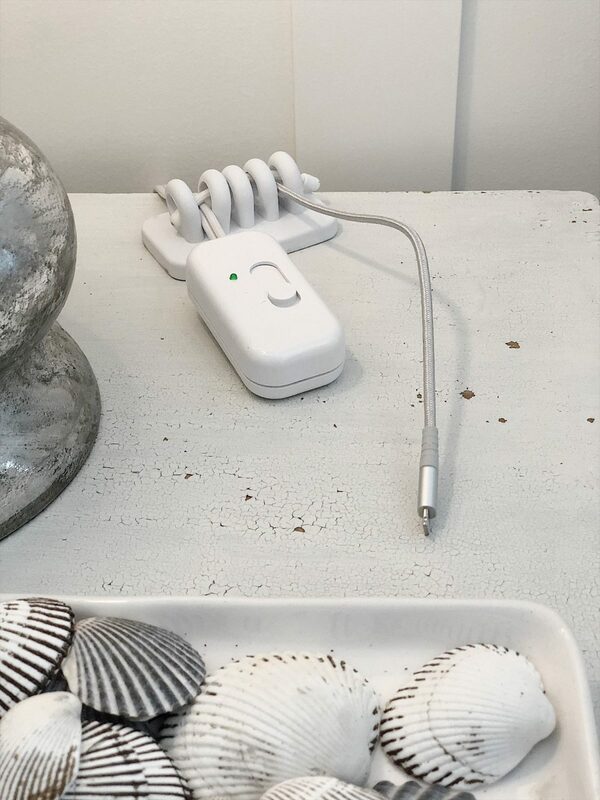 I think it is important to add comfort to a guest room so I added my two favorite gadgets. The first is a weighted cord holder (or cable organizer) which you can find on Amazon here. The second is a Table Lamp Dimmer. The dimmer allows someone to dim the light or turn the bedside lamp on or off. You can find the dimmer on Amazon here. My biggest priority in this room was to figure out a way to honor my boy’s sports careers. Each of them played a Division I sport and when I emptied out the room I took down a lot of trophies, awards, and posters. I knew I had found the solution when I did some research to see if I could find the original patent drawings from equipment for their sports. I had a hard time finding volleyball and I finally reached out to a vendor on Etsy and he found the volleyball one for me! So I ordered the three prints and framed them (in frames from the Pottery Barn Outlet) and I am thrilled! 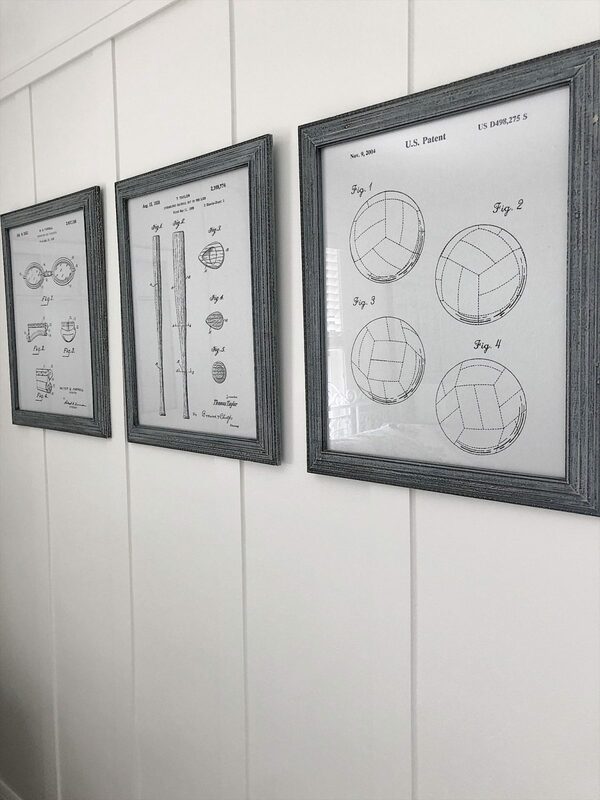 The prints feature swimming goggles, baseball bats, and volleyballs. Just so you know, there are patent prints for just about anything you could ever want. I would love one of these prints in my kitchen or laundry room or wine cellar. Plus they come in all types of print and paper colors and in all different sizes. And they are very inexpensive. Go to PatentPrint on Etsy and look at their inventory. They have thousands of prints. If you don’t find what you are looking for then ask them. They will probably find it. You can also use the coupon code MY100YEAROLDHOME for a 10% discount through August. I bought a few white windows at the same pop-up sale where I bought the trunk. I love how they look above the side tables. 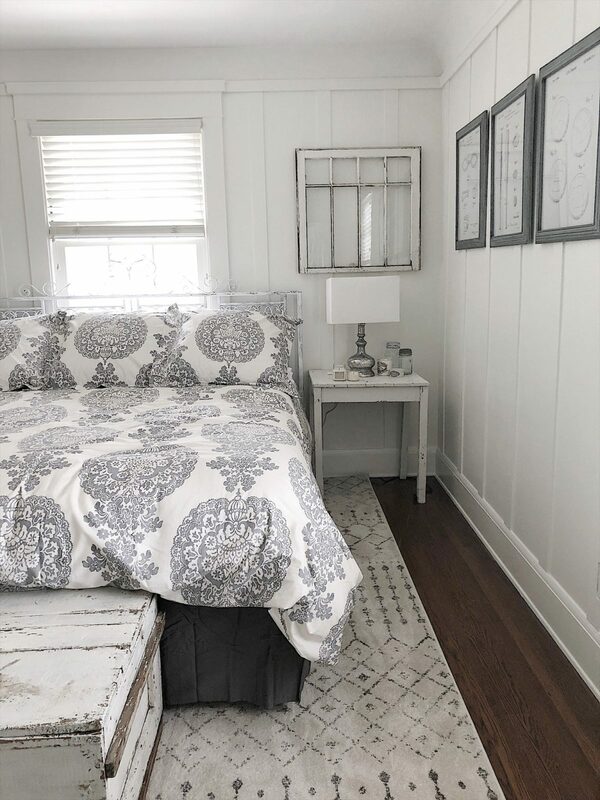 Old white windows are a great and very inexpensive way to add decor to the walls. The rug is from Wayfair. I have seen this rug online a lot and I have to say, it’s so much better in person! The quality is fabulous and it’s a lot thicker than I expected. I got it a few weeks ago online during their big one day sale. You can find it on the Wayfair site here. The bedding is from Pottery Barn. 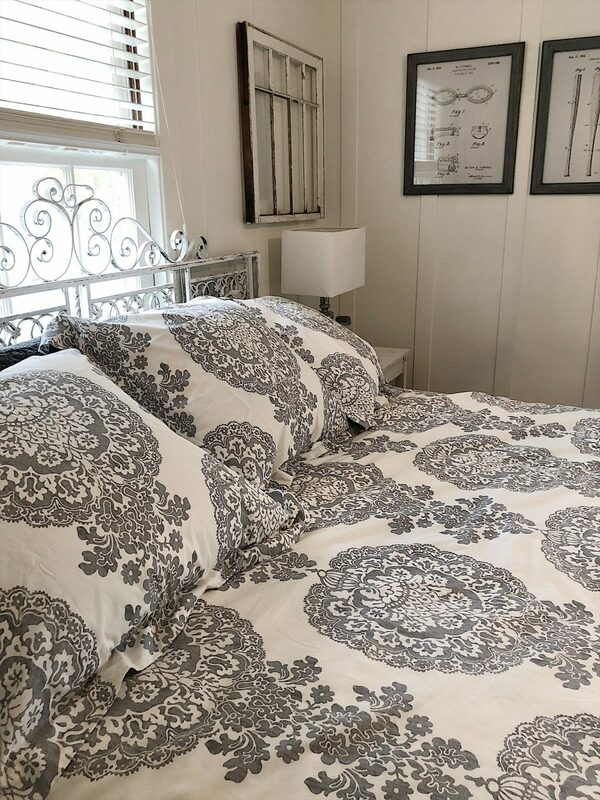 I purchased a duvet cover and Euro Shams and it’s called Lucianna Medallion. 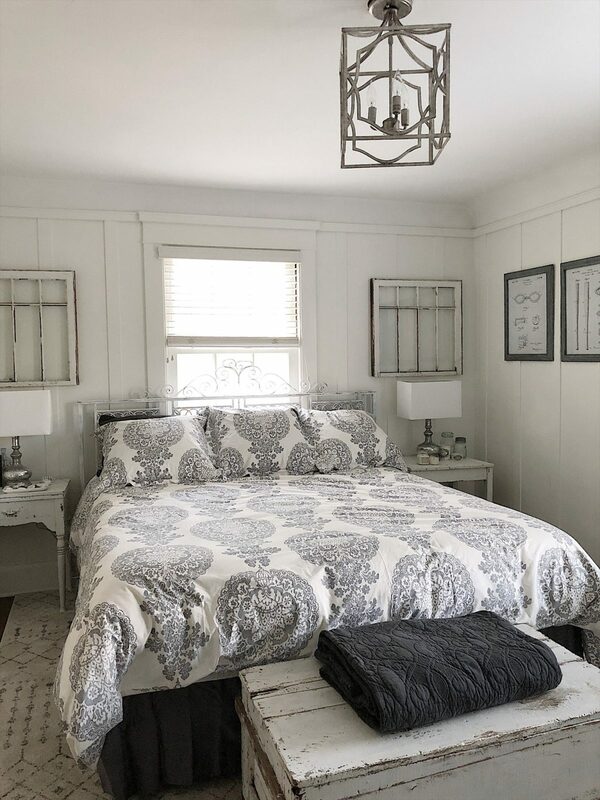 The Lucianna bedding is all on sale right now and you can find it here. I had some fun “shopping my house” for accessories. I am such a flea market shopper and I always have extra stuff around the house that needs a home. 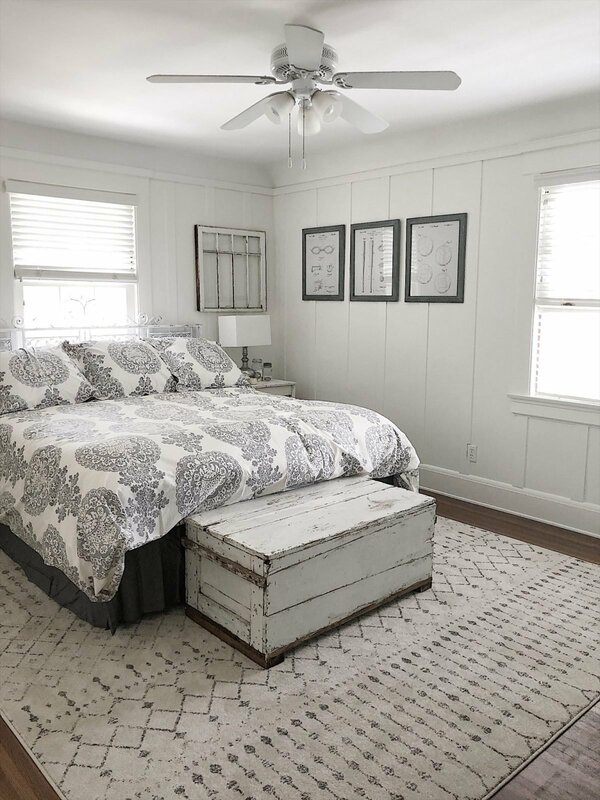 The two French shutters on the wall were purchased from @debrahalllifestyle at the fabulous show Barn House Chicks Market. Aren’t they just perfect? We have a Jack and Jill bathroom between this room and the other boy’s room. Of course, I call it a “Jack and Jack” bathroom. Please ignore the cord in the photo above. This is real life folks and it’s too late to try to take another photo! 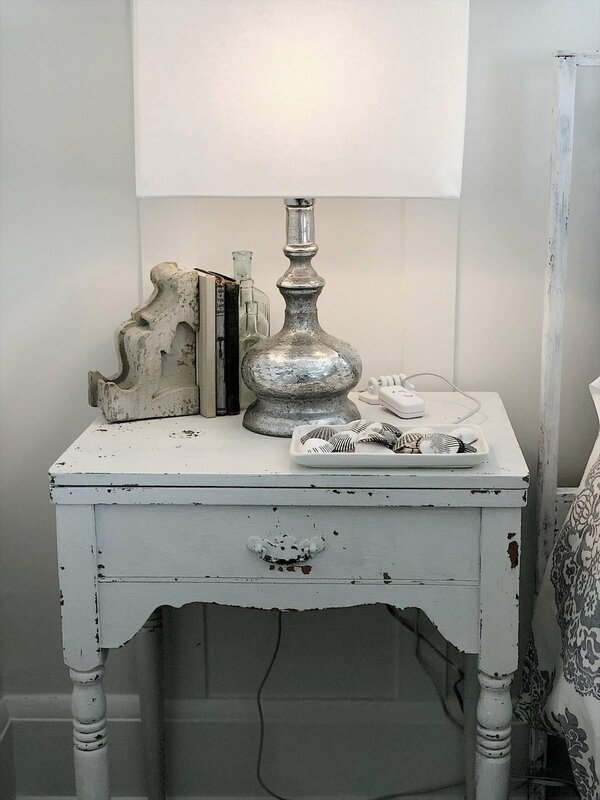 The antique mercury glass bedside table lamps are from Pottery Barn. You can find them here. The ones I bought didn’t have a shade so I went to Target and found these very inexpensive lampshades. The very last thing that happened in this room was the installation of the ceiling light! It arrived late and somehow we got it installed on the last day. It’s from Build.com and you can find it here. I love the pewter antique look and I like it a lot better than the ceiling fan. I hope you like the remodeled Boys Room as much as I do. I will add some more color throughout the seasons but so far my boys love it! 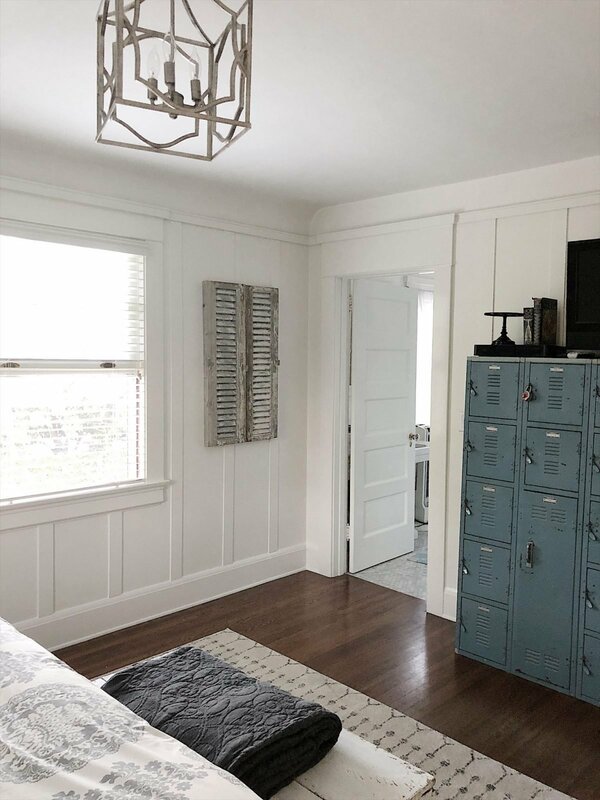 You will want to go check out all of the other One Room Challenge remodeled rooms here. Talk about inspiration, oh my! What a beautiful transformation! I love it all! So much fun ‘tagging along’ on this transformation. LOVEEEEE the ceiling fixture!!! How do you hear about pop up shop? I want a trunk and haven’t found one that I like. I live in the LA area if that helps. Beautiful written & each piece has found its rightful place, hasn’t it?! Thanks for including us in your journey. xo Diane???? I love the room and all your milk-painted furniture. Great job! I enjoy following your blog and IG. 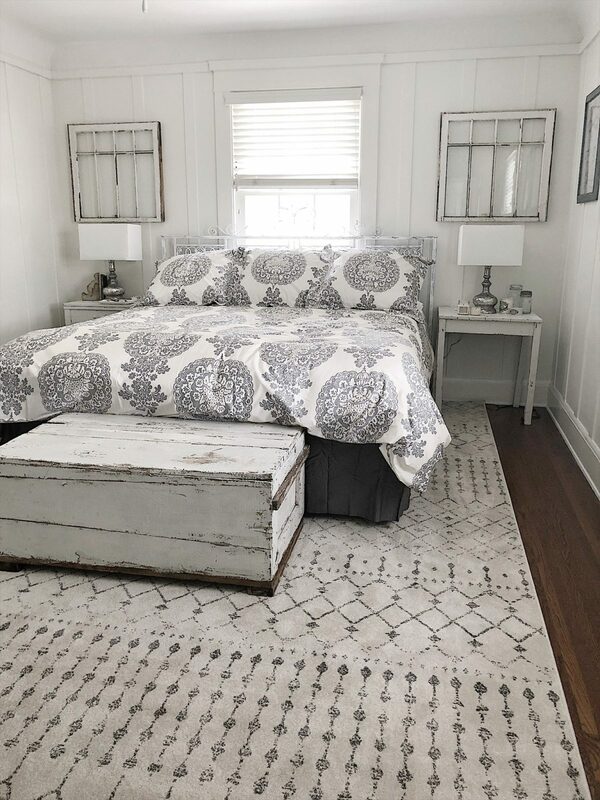 Just a tiny comment: I always want to turn your rugs under your beds about 90 degrees though so that they lie perpendicular to the bed (more rug showing to the sides, less to the front of the bed). Diagrams for suggested bedroom rug layouts can be found here: https://safavieh.com/area-rug-tips. Of course, there are no real rules…so keep it the way you like it!